What is a Sponge Cake? 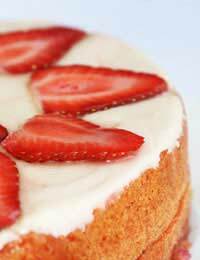 The traditional sponge cake is made with eggs, flour and sugar-but no fat-and should have a light, porous texture like a sponge. When butter or margarine is added to the whisked ingredients it becomes a much richer type of sponge, known as Genoese.Genoese sponges need slightly longer baking but they do keep better than the fatless sponges.When making sponge cakes, the most important steps include keeping the mixture stabilised andblending in the flour carefully. Prepare two 18cm straight-sided sandwich tins by greasing them lightly with butter, then dust with flour and a little sugar. If using an electric food mixer break the eggs into the bowl and gradually add the sugar. Whizz until the mixture looks quite thick and pale. Sift the flour and salt-twice-into another bowl, before carefully folding it into the egg and sugar mix.If doing this by hand, position your mixing bowl over a pan of hot (but not boiling) water before breaking the eggs into it, then, slowly whisk in the sugar. Remove mixing bowl from the heat as soon as this mixture is thick enough to leave a trail with your spoon. Avoid over-heating, as this can make the texture of your sponge tough and heavy.No need to heat the bowl if using a mixer-the friction creates enough heat to stabilise the mixture. Now divide the mixture between the two prepared tins and bake just above the centre of the oven for about 15 minutes. The cakes will look pale brown and feel springy to touch. Use a palette knife to gently ease the cake away from the edges of the tins then, leave them to cool on a wire rack until they are cold. Spread jam over the base of each cake and whipped cream over one only. Place the cake with just jam on it on top of the other one, to make a jam and cream sandwich. Dust with icing sugar or caster sugar and refrigerate. Grease two 18cm straight-sided sandwich tins. Line the bases with greaseproof baking parchment.In a food processor, whizz 175g of the butter until soft then beat in the sugar and lemon rind until the mixture is pale and fluffy. Beat the eggs in a separate bowl before adding them, gradually, to the mix.Sift the flour-preferably twice-then fold half of it into the other ingredients. Now, pour in the whisky, followed by the other half of the flour and mix well. Divide this mixture into the tins and bake for about 20 minutes.Meanwhile, whizz the remaining butter with the thick honey. Slowly add the icing sugar with 1 tablespoon of juice from the lemon. When the cakes have cooled, use half of this honey/butter cream mixture to stick the two together and dollop the rest over the top in a swirly pattern. Halve 4 of the walnuts and decorate the outside edge with them. Crush the other two walnuts and sprinkle them on top of the cake, in the centre.Try hard to share this; it’s not easy!